Home Comparison Gionee M6 Lite vs Infinix Hot 4 Pro: Lite goes against Pro! Following in the footsteps of its predecessors, the Gionee M6 Lite comes in a metallic back design with narrow bezels on the sides. It also comes with other interesting features like an advanced encryption, offering a triple security system to keep your phone secured. The Gionee M6 Lite is a budget variant phone that was downgraded from the M6 to give users an additional option of a low-cost smartphone. The Gionee M6 Lite is a successor to M6 and M6 Plus launched earlier in the year. On the other hand, the Infinix Hot 4 Pro X556 is slightly different from the previously made Hot 4. The back is still textured, but the pattern is very much different. The colour options also changed with the Infinix Hot 4 Pro available in Mysterious Blue, Glossy Silver, Champagne Gold, or Anthracite Grey. The Hot 4 Pro adds super-fast 4G LTE to the Hot 4. 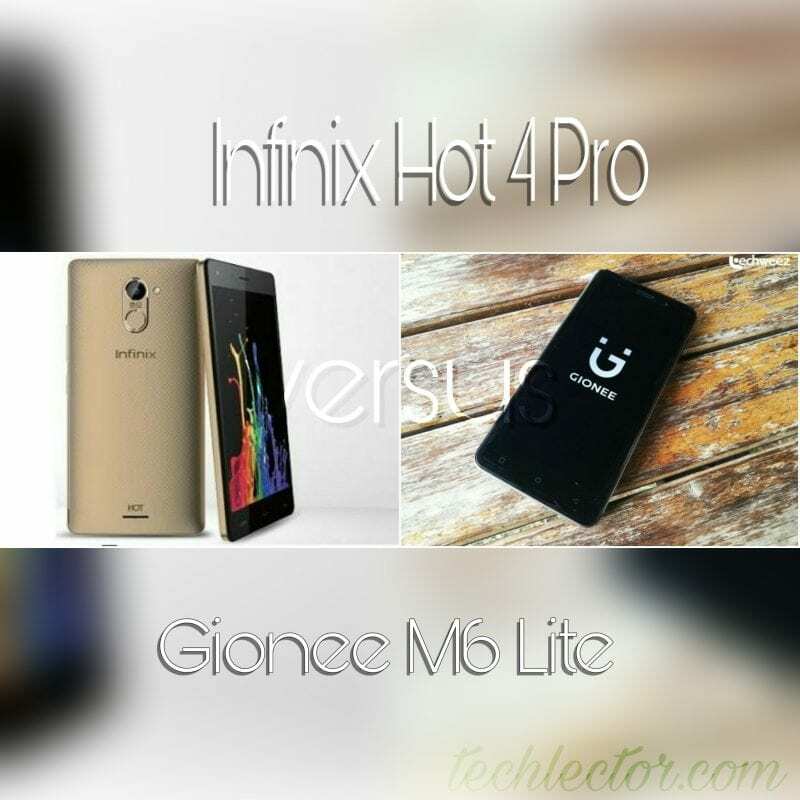 In this article, I pit Gionee M6 Lite against Infinix Hot 4 Pro. I’m going to compare them according to their specifications (display, design, memory, battery, hardware, software, etc) and when I’m done, I’ll leave you to choose which one is best for you. Enjoy. As for the design, the Gionee M6 Lite smartphone sports a slim metallic body design that combines rigidity with sleek look. It has narrow bezels on either the side, the Gionee M6 Lite sports a 5.5-Inch Full HD IPS, and a resolution of 1080 x 1920 (401 PPI) pixels to give a good picture quality while the Hot 4 Pro also features the same screen size at 5.5-inch Full HD IPS display but lesser 720 by 1280 pixels resolution. This implies that, although they may have the same display specs, the picture quality will be better in the M6 Lite. The Gionee M6 Lite comes with a more powerful Octa-core MediaTek MT6755 Helio P10, with Mali-T860MP2 GPU and a speed of 1.8GHz frequency processor. In contrast, the Hot 4 pro comes with Mediatek MT6737 chipset and a speed of 1.3GHz quad-core processor offering a lesser performance to that of Gionee M6 lite. In terms of storage, the Gionee M6 Lite offers a 4GB RAM, 64GB ROM which is expandable to 256GB through a slot for the micro SD. As for the Hot 4 Pro, it has 2GB RAM and 32GB microSD and it also supports up to 128GB via microSD memory card. For photography, the Gionee M6 Lite comes with 13MP f/2.0 aperture phase detection autofocus, dual-LED flash rear camera and 8MP front camera, however, the Hot 4 Pro has a 13MP rear camera, an improvement on Hot 4 which sports 8MP. The Hot 4 Pro also has a 5MP front-facing camera. The M6 Lite still beats the Hot 4 Pro in spite of its improvement. At the power house, the Gionee M6 Lite packs a more powerful non-removable Li-polymer 5000mAh battery to give you a long-lasting battery with a fast-charging ability while Infinix Hot 4 Pro has a 4000 mAh battery with up to 20 hours talk-time. In terms of connectivity, both the Gionee M6 Lite and Hot 4 Pro support Wi-fi/2G/3G/4G/LTE. The devices come with a Bluetooth, USB type C port and a GPS. So there’s no clear-cut difference between the two phones. The Gionee M6 Lite runs on Android 6.0 Marshmallow with Amigo 3.2 UI on top of it. It also features a fingerprint sensor that opens at a speed of 0.23 second while the Infinix Hot 4 Pro also runs on Android 6.0 Marshmallow and also offers a fingerprint sensor on the back. In Nigeria, the Gionee M6 Lite sells for N82,740 while the Hot 4 Pro is sold at major retail stores for a price of N54,000. Even though, we were able to establish that the Hot 4 Pro made some improvement on Hot 4, it still cannot match the Gionee M6 Lite. If I have to choose, I will go with the M6 Lite. So, which would prefer between the Gionee M6 Lite and Infinix Hot 4 Pro based on our comparison above?